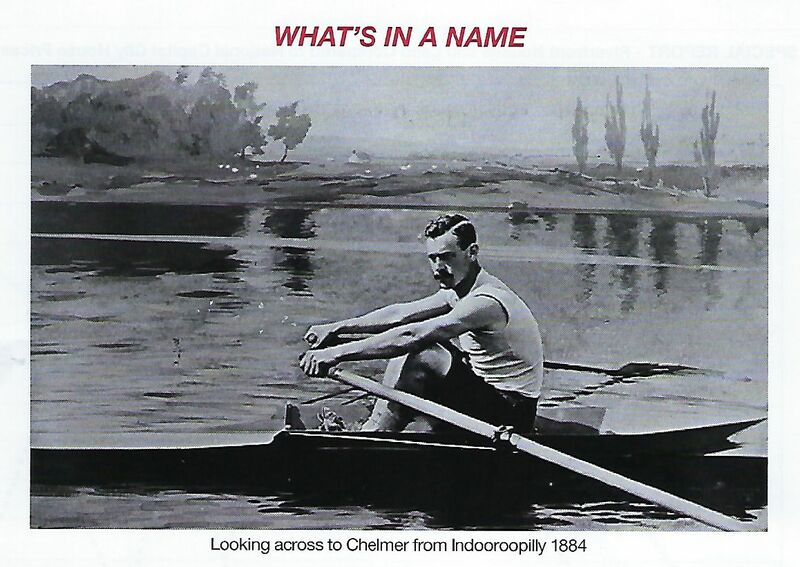 The Ned Hanlan Exhibition Sculling Race at Indooroopilly. It is hard to imagine a sporting event on the Brisbane River in 1884 might draw huge crowds especially far out from the city centre, but a rowing regatta at Indooroopilly featuring an international champion proved such a drawcard, special trains and steamboats had to be put on to handle the masses. Rowing at that time was a very popular sport all around the world and in Brisbane, already home to a number of clubs local and inter-colonial regattas, were regular events that were well attended. In March 1884, Ned Hanlan, the Canadian single sculls world champion who had defeated the Australian champion Ned Trickett in England four years previously arrived in Sydney ready to race again. Over the next twelve months, the east coast colonies suffered “virulent attacks of Hanlania” as he moved between Melbourne and Sydney. 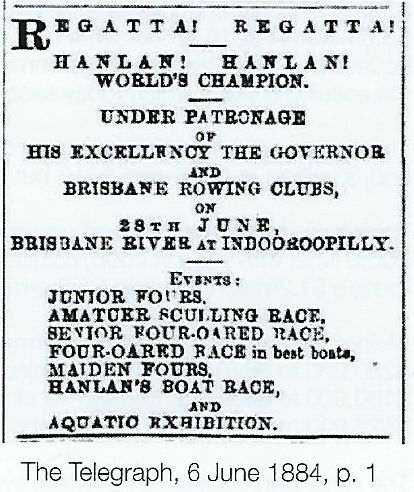 In a ‘Great Sculling Match-up’ on April the 14th in Sydney, Hanlan again defeated Trickett before a big crowd. 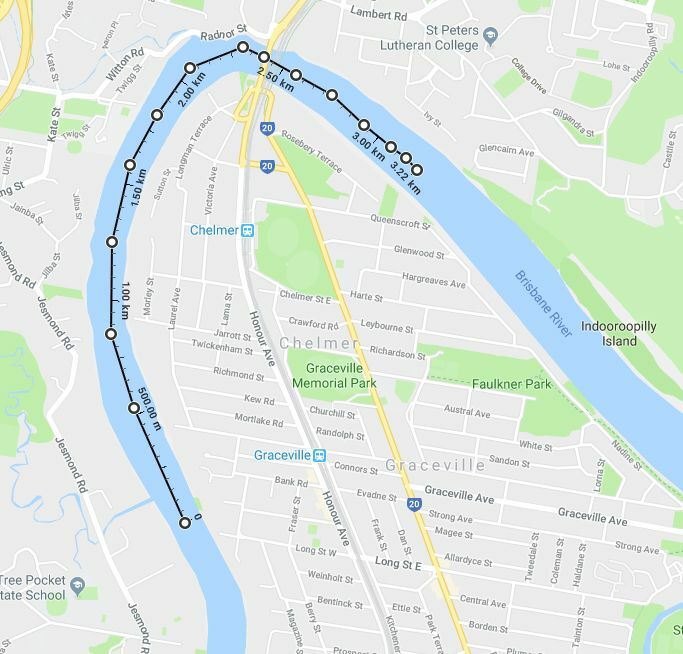 Then came the news he was coming to Brisbane and would compete in an exhibition race at a regatta to be held on the Indooroopilly Reach of the Brisbane River over the coming Queen’s (Victoria’s) birthday long weekend. The site chosen for the much-anticipated regatta was below the Albert railway bridge, with the course running from a point 1½ miles upstream of the bridge to another ½ mile downstream. This was 3.2 km in total length. Grandstands were constructed on the Indooroopilly side as well as several viewing points were set up on the opposing Chelmer bank. Despite such a build-up, the event didn’t go off as the organisers had wished. Firstly, the people of Brisbane so used to free admission to such events baulked at the idea of having to pay to attend, with great numbers vetoing the event as a consequence. Thousands still did make the trek though, climbing aboard overcrowded trains and steamboats. The public frustration was heightened when many attendees found their view of the event obscured by fences along the banks of the river. A further organisational oversight was the fact the course itself was laid out on a bend in the river which greatly favoured rowers on the inside. Hanlan’s much-heralded race against two local men on the day also proved a bit of an anti-climax. Such was his superiority he was able to toy with his opponents by speeding ahead of them and then dropping back to let them catch up. One of them even managed to capsize. The Brisbane Courier reported “plenty of grumbling” as spectators wended their way home. History shows that Hanlan went on to race in several more regattas in Melbourne and Sydney, during which he was twice defeated by new Australian champion Bill Beach. On the second occasion in March 1885, a crowd of over 100,000 turned up to watch the race on the Parramatta River. Despite the Brisbane event being a bit of a fiasco, Hanlan Street and Regatta Street in Chelmer remain as timeless reminders of the day the great Ned Hanlan came to town. Information supplied by the Oxley-Chelmer History Group.